As a broadcast engineer or A/V professional you likely have diverse needs when it comes to managing SDI signals within your environment - for monitoring, distributing, switching, multiplexing, and processing 3D in real time. Until now, you have been forced to purchase different devices to perform these tasks. The new Matrox MC-100 solves all these challenges in one inexpensive, easy-to-use device. 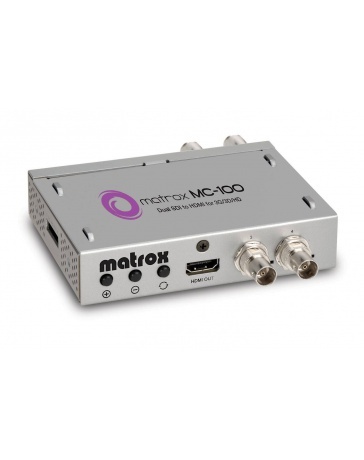 Matrox MC-100 is a dual SDI to HDMI mini converter that supports a wide range of display resolutions through 3G, Dual Link, HD, and SD-SDI. This single portable unit can be used as a HD-SDI switcher, a distribution amplifier, a multiplexer, and a 3D processing unit, making it the most versatile mini converter on the market. It should be in every video professional's toolbox. Take your SDI video signal with 16 channels of embedded audio and convert it to HDMI. Whether you're using RGB or YUV, Matrox MC-100 maintains the full 10-bit video spectrum of the signal, up to a resolution of 1920 X 1080. Eight channels of embedded audio are supported on HDMI, selectable between the first and second set of 4 pairs. Configure MC-100 as a distribution amplifier to boost the strength of your SDI signals by 300 meters on SD-SDI, 100 meters on HD-SDI, and 70 meters on 3G-SDI. Duplicate a single SDI input signal to two independent, amplified signals. Quickly and efficiently configure your Matrox MC-100 via the on-screen-display (OSD) menu available on all outputs. There is no need for a computer connection. Every MC-100 feature is accessible through the OSD, which is controlled by three buttons directly on the unit. User-defined presets can be saved to dip switches for even quicker setup. Toggle between two HD-SDI inputs at the touch of a button, glitch-free on both SDI outputs as per SMPTE RP-168. MC-100 is also a loss-of-signal switcher. You can configure the device to automatically switch to the second valid input if the first one is lost or becomes invalid. As an added benefit, the LEDs on MC-100 illuminate green or red depending on signal validity. Transport your SDI signals efficiently using MC-100 to multiplex two HD-SDI signals into a single 3G-SDI stream. 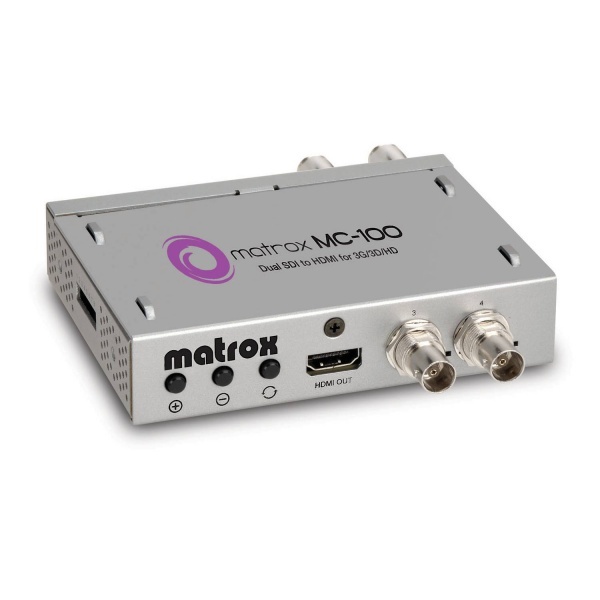 On the receiving end, a second MC-100 or another SMPTE-425M compatible device demultiplexes the signal, providing two independent HD-SDI video signals. Being able to multiplex two SDI signals means that you'll need just half the wiring to distribute HD-SDI video signals. Use the cutting-edge processing power of MC-100 to make multiple adjustments on stereoscopic video feeds in real time. Hardware buttons let you perform Horizontal Image Translation (HIT)—pixel-based convergence and divergence—on both video inputs. The images can be flipped horizontally and/or vertically, with pixel-based offset controls. Monitoring 3D content can be done on the HDMI or SDI outputs, with several analysis modes such as anaglyph, difference and 50/50. The signal can then be sent on a single SDI cable as a side-by-side or an over/under feed. On HDMI it can be sent in side-by-side, over/under, or frame packing mode. MC-100 also features a built-in video frame synchronizer that is useful for 3D production. When you define one of the video inputs as the reference source, the unit time base corrects the second video input and outputs the two video streams in sync.